Lms34LED-CG is an LED from a new line of light-emitting diodes with special glass covering. 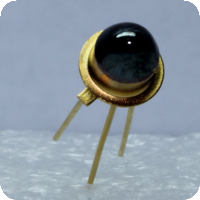 These LEDs reveal 3-5 times higher output optical power comparing to conventional LEDs and help to improve measurement accuracy. Lms34LED-CG model with a peak emission at ~3.3 µm is well appropriate for hydrocarbons detection (methane, propane, butane, ethane) and for the analysis of other substances that have absorption bands in this range.